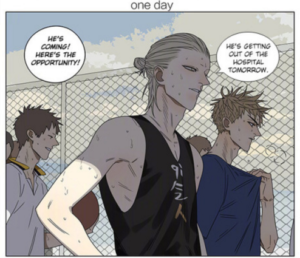 Is it me or does Jian Yi look a lot more mature in appearance? He looks a lot more like his grown-up self now than he did in the first 200 chapters. I think it’s his new hairstyle. It makes him a lot older and a lot more mature. 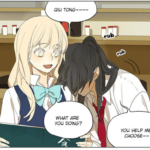 This wasn’t as funny for me as the previous chapters, the jokes fell flat with me, but it is a very very cute chapter. I’m still not quite sure how Zhang feels. He has been really quiet of late. He’s barely had any page time, and he hasn’t had a plot centered around him either. 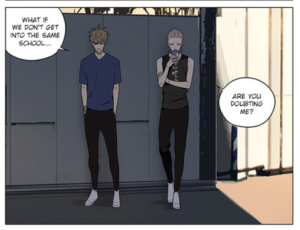 To be honest, we don’t really know anything about Zhang’s life, except that he had a sister and he befriended Jian Yi in nursery. 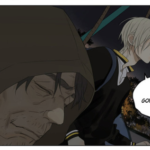 Hopefully, we’ll get to know a little more about his background and his family in upcoming chapters. Zhang Xixi is a hugger. We know this. 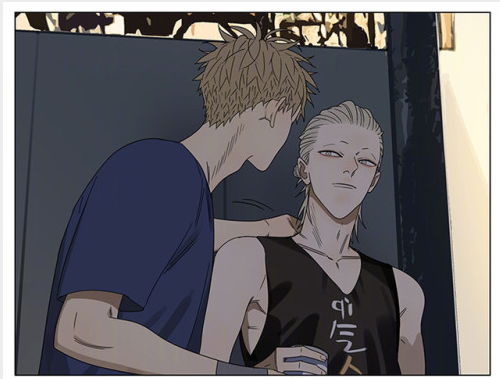 It’s nice that he’s showing some form of affection rather than violently hitting Jian Yi all the time. I’m still not too sure about their relationship. It seems to me that they are testing the waters a bit. One final thought: What is Guanshan’s secret? 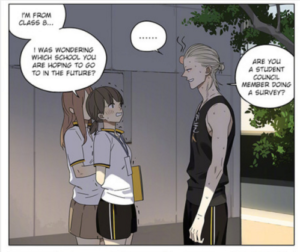 Has he told Jian Yi of his dad? 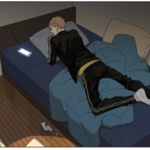 Has he told Jian Yi how he feels about He Tian? Is there something else that we don’t know about? I cannot wait to find out!! I’m really excited to see where this plot goes! Next Chapter: It’ll either be a continuation of this chapter (where we might find out Guanshan’s secret). We might be heading back to Guanshan and He Tian’s storyline. I’m 50% sure we will not see Tian’s dad as we haven’t seen anyone’s father yet. We didn’t even see Guanshan’s dad’s face. We’ll see though.